Trying to find time in your busy schedule to make dinner is one thing. Trying to find time to go to grocery store is a whole other. 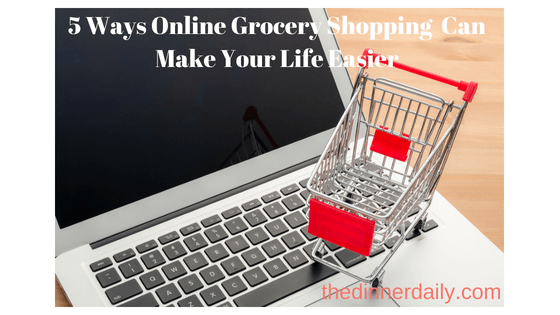 There are plenty of strategies you can use to make grocery shopping more efficient (including our personalized Dinner Daily shopping lists), but one of the most recent trends is to take advantage of online grocery shopping. Whether you order for pick-up or delivery, online grocery shopping can not only make your weeknights less hectic, but it can even help you save on groceries too! This is the most obvious benefit, but it’s still worth talking about. Instead of trying to squeeze into a parking spot, or running into someone you know when you are definitely not up for it, you can get everything you need for dinner while finally catching up on this season of Scandal. And if you have little kids at home, need I say more. Grocery shopping with young children is not for the faint of heart. If you’re not going to be at home at a convenient time for the delivery, check to see if your store has curbside pickup. Then you can just order your groceries for a set pick up time, pull up to the store, and they will come load your groceries into your car. Magic! Unless you’ve got a Fitbit goal you’re trying to meet, nothing is more frustrating than getting all the way down to the produce aisle – before realizing you forgot to get milk way back in the dairy aisle. Or when the cashier is ringing you out and you remember you never grabbed eggs. When you’re shopping online, you don’t have to worry about making such mistakes. Instead of wasting several minutes, it just takes a couple clicks to make sure the contents of your cart are perfect. Depending on what service you use, a lot of online grocery services will have sales from your local grocery store right there in the interface. Some will even let you filter groceries by what’s on sale and what isn’t. This is a simple way to take advantage of all the great deals your grocery store has to offer. Imagine if every time you went to your grocery store, your favorite products were already waiting in your shopping cart for you. This can be a reality when you shop online. Once you’ve used an online grocery website once, the next time you order you may be able to select groceries from what you’ve previously purchased. This is especially convenient for essential items that you have to buy every week. Another great advantage to shopping online in general is that the total cost of your cart is easily visible at all times. It’s easy to go over budget when you’re buying dozens of different items at once, especially when math is not your strong suit. Impulse purchases are just too tempting in the store and can be a big add to cost. Or, if you are hitting the stores with kids, they can often sneak in a few packages of this and that when you are not looking. When you’re shopping online, you know what your total is at all times, and it’s easy to remove something if you later realize you don’t need it. And it’s totally kid proof. Double win! While there are definite advantages to shopping in store, shopping online may be the perfect antidote to your busy life. The Dinner Daily offers links to many stores’ online grocery shopping websites from our shopping lists, and we have one-click ordering from Peapod. For anyone in the Northeast US, or in the Indianapolis, Chicago and Milwaukee areas (i.e. areas serviced by Peapod) you can plan your week’s dinners and order all the ingredients in less than a couple of minutes. All the convenience of meal kits at less than half the cost and without all of the excess packaging. Learn more about The Dinner Daily. I live in Old Orchard Beach,Maine 04064 York county. I am 70yrs -no transportation to get food. HELP! Hi Rhonda, The Hannaford in Biddeford has Hannaford to Go, in which if you order online at their site, they will pick and get it ready and perhaps you could ask a friend or neighbor to pick up for you. Unfortunately they do not have delivery. Here is the link to their shopping site: https://www.hannaford.com/content.jsp?pageName=HannafordToGo&leftNavArea=ShopLeftNav be sure to select the Biddeford store before ordering.